Home > Treating Back Pain > Are Back Braces Useful? At some time or another, many people suffer from back problems, from a simple strain from lifting something too heavy, through to a serious injury or a problem with growth. Back braces, by providing support or restricting movement, can help with healing or prevent any further injuries. Wearing the wrong brace could cause as many problems as not wearing a brace at all, so they should only be worn after medical advice, and should always be fitted by professionals. Back braces can help people after back operations, such as spinal fusion surgery, by reducing movement by up to half and giving the bones time to fuse and repair. Post-surgical braces are usually made out of rigid plastic or other materials, secured with a fabric or elasticated belt. They are designed to follow the curve of the spine, and can be heavy and uncomfortable to wear, though they should help to reduce any pain from the surgery. The braces should be fitted properly to reduce discomfort and ensure that they provide the best support possible, and should be worn as advised to improve the chance of success. Some back braces are designed to reduce ‘hyperextension’ (bending too far backwards), and are useful for people who have had a compression fracture of the vertebrae (the bones that make up the spinal column). Like post-surgery braces, these are usually rigid and act by supporting the spine and helping to keep it stretched. These braces relieve the pressure on the vertebrae and reduce any associated pain, as well as restricting movement to help healing. Both the support and the reduction in movement give the injuries to the bone time to heal. The brace needs to fit as well as possible, and should be fitted by a professional. Back braces designed to help with lifting are usually made out of canvas and elasticated fabric. 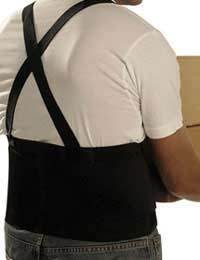 They work by providing support to the back muscles and reducing the risk of injury when carrying very heavy objects. These braces come in the form of a corset, or as a belt, and will also help keep the injured area warm. Corset-style braces may also be used after injury or surgery to reduce movement and allow bones time to heal. Some come with magnets that are supposed to aid healing, but there is no scientific proof that braces including magnets work any better than ordinary braces. Scoliosis is a curving of the spine, and can be minor, or can cause pain and difficulties. Back braces can help scoliosis in children and young people whose bones are still developing, by applying pressure and so guiding the growth of the spine. This can stop worsening of the curve, or may even correct an existing slight curve. Braces may need to be worn up to 23 hours a day, or just at night, and can be unsightly or uncomfortable, though some can be hidden completely under clothes. Back braces can be used to correct poor posture, and may help to remind the wearer to sit correctly. However, learning good posture may be more useful for back health and strength long-term – yoga, Pilates or Alexander technique all focus on posture.